Migrations and population dynamics are considered very problematic topics in the fields of ancient studies. Recent scholarship in (pre)historical population has generated new impulses by using scientific approaches using radiogenic and stable isotopes, and palaeogenetics, as well as computer simulation. As a result, the state of migration research has undergone rapid change. 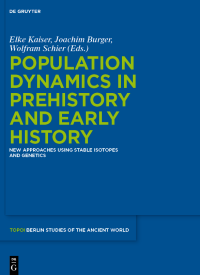 Several research groups presented papers at a conference held in Berlin in 2010, addressing specific historical aspects of population dynamics and migration, with no chronological or geographical restrictions, in the light of cutting-edge bio-archaeological research. This volume, divided into three larger thematic sections (isotope analysis, population genetics, and modelling and computer simulation), presents experiences and insights about methodological approaches, research results and prospects for future research in this area in a varied collection of papers. Scholars from widely diverse scientific disciplines present their approaches, findings and interpretations to an audience far broader than the circles of the individual disciplines.